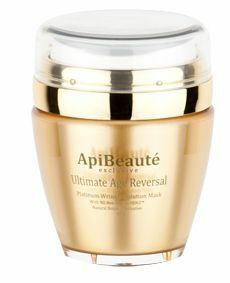 Buy the Platinum Wrinkle Solution Mask, from the ApiHealth Natural New Zealand Bee Venom Mask range, as a natural and safe alternative to Botox, to help reverse the signs of aging and help bring back your skins natural beauty. Caution: Not recommended for use if you suffer with bee allergies. The key magic ingredient is New Zealand Bee Venom VENZ™, which makes skin appear more firm and toned. The appearance of fine lines and wrinkles will also reduce over time with continued use. Bee Venom is the 100% natural way to treat your wrinkles and make your skin look younger. The masks’ smooth texture will soften your skin, add tone and make it as smooth as velvet because there is combination of natural herbal extracts and UMF10+ Manuka Honey. UMF Manuka Honey is unique to New Zealand and is also a perfect ingredient for skin care, due to being rich in natural proteins, vitamins, minerals and having a high content of hydrogen peroxide. Manuka honey has proven to be excellent for cleansing the skin of impurities as well as nourishing the skin to assist a beautiful, vibrant complexion. It assists in keeping skin hydrated, fresh and healthy. Bee Venom Ultra Lifting Mask releases a warm sensational feeling that will create a calming effect on stressed skin influenced by everyday pollution exposure and sunlight. Although it may seem unreal but our products will actually influence your mood for the better. As they contain VENZ™ which has been proven to influence the mind as well as the body creating a more relaxed and harmonious mood. With continues use of our unique products, as many of our customers, you will find that your skin has never looked healthier or younger. So treat yourself and try out these amazing masks (one or both) as you have will find your skin will thank you for it.